Down the page is a bizarre tweet from a local middle management journalist who appears to derive pleasure from seeing the Wirral CEO change every 2 years, and from therefore being part of the problem. Still, there’s always a darker flip-side to these issues. He vill haf to obey orders. And as a salaried, controlled, strait-jacketed underling at TrinityMirror (google #phonehacking) and with a career to carve out, he would certainly stand to gain from keeping on message and not rocking the boats of the powers that be, particularly those that are now gliding via smooth passage towards the safe harbour of a stealthy, healthy and wealthy retirement. His employer, TrinityMirror, publishers of the pisspoor Wirral News, have proven themselves to be not backwards in coming forward, particularly when lavishing targeted gifts upon delighted Wirral leader Councillor Phil Davies). 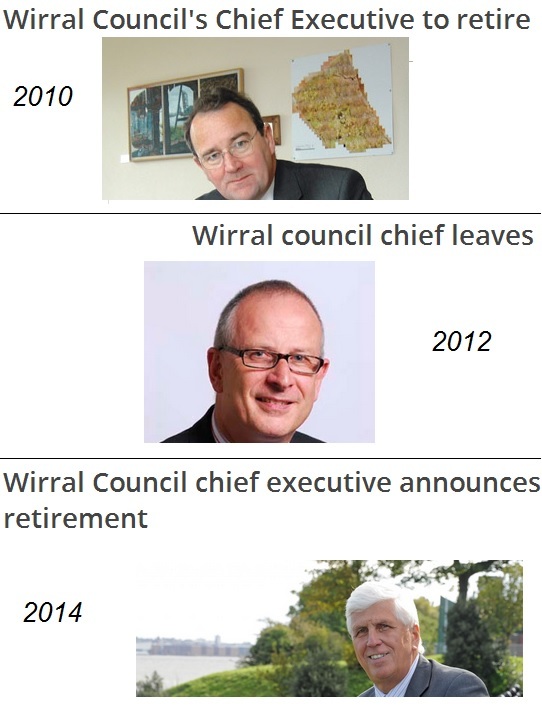 The shortchanged, sidelined, alienated Wirral public however, desperate to find reportage of ongoing, unaddressed council corruption are being greeted with page after page of happy clappy bilge, and are left to peer into their empty wallets and purses and ponder what the hidden kickbacks must have been. In the aftermath of the Burgess announcement, I’d suggest TrinityMirror’s Merseyside journalists get themselves up to speed on the sheer depth and extent of local public outrage by reading and digesting the comments here. The Wirral public have spoken!!! !